4-6-0: This transition locomotive for passenger and mail trains came in between the 4-4-0 and the 4-6-2 on many railroads. The 0-8-0 was the B&O's favorite for its coal trains for some 40 years. Winan's Camel's were the best known and most prevalent model. This is what I have to live with folks. My guy loves his trains! @Jimklag, I bet Cindy can relate. Yes @Southern Unionist, I know this is a 4-2-0!!! How do you bear it?! Sir, excellent primer! Read about the number configurations but didn't really understand them until they were backed up with pics. Lovely paint scheme! They didn't use much blue back then, but I like it a lot! I'll get into posting some pics in a few days, when I get more time. I have a lot of museum shots in my archives. The 0-8-0 was the B&O's favorite for its coal trains for some 40 years. Wow, that's a really small boiler for a four (powered) axle steamer. 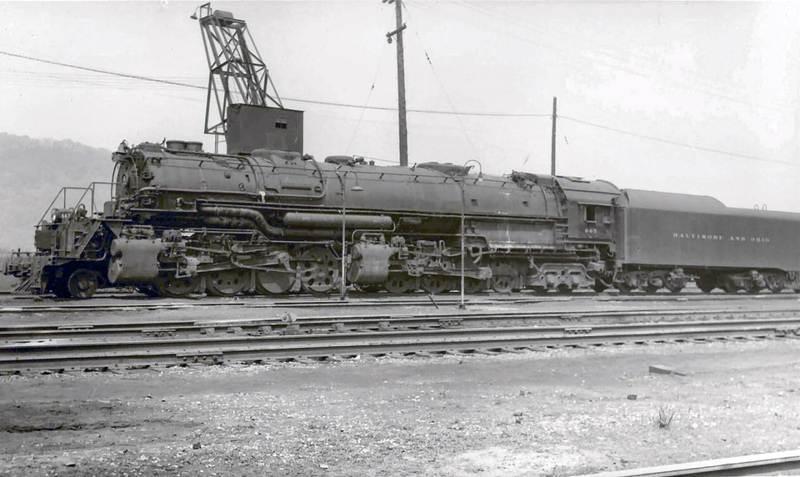 That photo of the 2-8-8-4 is impressive, the largest engine that I have seen was at the York railway museum, it was a Chinese 4-8-4 KF and it dwarfed everything around it, it was 15 feet tall and 93 feet long but it’s just a baby compared to that 2-8-8-4. I’m betting that seeing something that big in full steam and motion is breathtaking. just a baby compared to that 2-8-8-4. I’m betting that seeing something that big in full steam and motion is breathtaking. Norfolk & Western's 2-6-6-4 design was just slightly higher in horsepower, designed to maintain higher average speeds in the mountains with high priority mixed freight, while the heavier 2-8-8-4's were assigned only to low speed coal drags. N&W's #1218 was for many years the highest horsepower operating steam engine left in the US, and I saw it pull several railfan excursions. It was incredible to watch it "bend" around curves. I rode behind it once, and its only shortcoming for pulling long passenger trains (18+ cars) was when the front and rear drive wheels happened to get in sync on a hard pull; you could feel slight power surges. The engineer would fix this by turning off the front sand for a moment and letting the front drive wheels slip just enough to get them out of sync with the others. That engine is stored in Roanoke, where the N&W 611 spends every winter, and could run again if sufficient funding is found someday. Currently, the 611 (4-8-4) is our most powerful steam engine that still runs on a regular basis. Its limitations on long excursions are getting the coaches started on a grade with only four powered axles, and getting around sharp mountain curves with a ridged four axle wheelbase. The 1218 suffers from neither problem. Other notable articulated steam engines stored in the East include Union Pacific's "Big Boy" at Steamtown (Scranton) and a C&O "pump face" at the B&O Museum in Baltimore. The only remaining N&W 2-8-8-4 is normally on display in Saint Louis. Steamtown's big engine was received in operating condition. 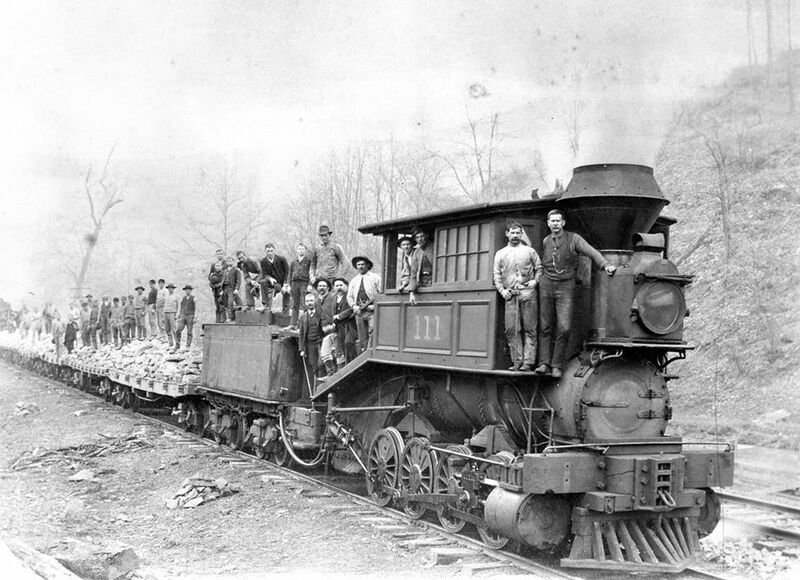 The lone 2-8-8-8-4 was built by Baldwin Locomotive Works. Very impressive and I was surprised to read that they were coal fired rather than wood. I thought steam locos in the U.S were for the most part wood fired. Intresting point about potential problems with track cohesion with lightened tenders. I suppose that the gradients that these engines were expected to climb negated any traction issues but the issue of mainting coal and water on these beasts must have been a logistical nightmare. I had wondered why the railroads hadn’t just stuck with the tried and tested method of using banking engines but it makes sense when one considers the vast distance these engines were expected to travel. A quick look at other railroads in the rest of the world shows that the preferred method for overcoming steep inclines was the use of a second engine but for the most part the second engine (banking loco) was only a small loco intended for giving a train a quick shove up the hill. After all of my waffle, what I’m really saying is that as impressive as these massive engines are they just don’t strike me as being practical or cost effective. I’m also guessing that maintaining these locos would have taken them out of service for weeks at a time. Now what I’d really like to see are pictures of these engines on shed, I can only imagine the size of the lifting gear used just to replace a wheel with a flat spot. Well I suppose somebody loved it ! I was surprised to read that they were coal fired rather than wood. Before the ACW, a few roads began the switch to coal - mainly because they had such easy access to tremendous supplies of it and easily obtainable wood was getting scarce. After the ACW, the change came fast and furious. The 2-10-10-2s were built in 1918 and lasted into the 1940s. The 2-8-8-8-4 in 1916 and only lasted till 1920. The 2-8-8-8-2s were built between 1914 and 1916. Not sure how long they lasted. ...they just don’t strike me as being practical or cost effective. They didn't end up being that. That is why they ended up being basically one-off experiments. Really cool looking but not economically viable. I’m going to test your knowledge here, how much weight could those engines pull on a straight and level track? And before someone asks, I haven’t got the answer.